Mainers register to vote in May 2011 at the Bangor City Hall. AUGUSTA, Maine — Supporters of same-day voter registration released new evidence Monday — about one month ahead of a November referendum — that they say supports their case for restoring a practice that has been in place for 38 years. Protect Maine Votes and the Yes on 1 campaign on Monday released hard data on voter turnout trends that suggest allowing voters to register on Election Day increases voter participation and, in some cases, saves money. The research cited was produced by national nonpartisan groups, well-known academic institutes and some progressive nonprofit groups. None of the studies were commissioned by the Yes on 1 campaign. The most recent study, released Monday by the Brennan Center for Justice, concludes states that allow same-day voter registration had higher turnout than states that do not. The study also says the top five states, including Maine, for voter turnout were all states that allow Election Day registration. Lance Dutson, CEO of Maine Heritage Policy Center, the conservative nonprofit think tank that is leading efforts to keep the same-day voter registration ban in place, disputed the research. Dutson said the Maine Heritage Policy Center was preparing to release its own research on Wednesday that shows problems within Maine’s election system, particularly when it comes to voter registration. 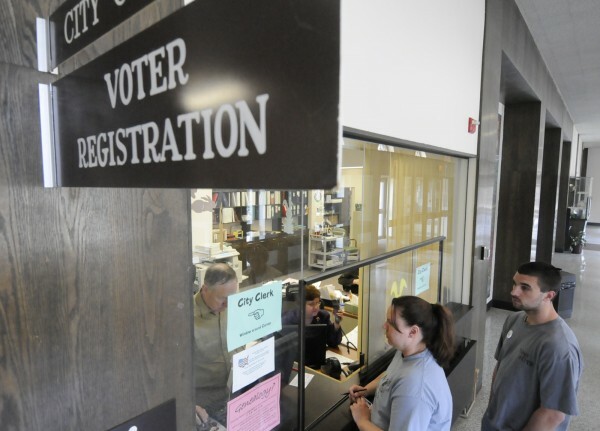 Same-day voter registration has been in place for nearly four decades but was eliminated with the passage of LD 1376 in June by the Republican-controlled Legislature. Critics of same-day voter registration said the practice makes it too difficult for municipal clerks to verify residency and legal requirements of potential voters and increases the possibility of fraud. Supporters of same-day voter registration said there is no evidence of fraud and have accused opponents of disenfranchising some voting blocs — most notably students. Since the bill’s passage, Protect Maine Votes has gathered the necessary signatures to force a statewide people’s veto in November. The change in law remains on hold pending the outcome of that vote, so voters can register on Election Day through November. In addition to the national research, Protect Maine Votes on Monday also cited a report by the Maine secretary of state presented to the Maine Legislature in January indicating the state’s central voter registration system is sound. “While there is still work to assure the CVR contains the most complete and accurate data, and that it best serves local election officials and Maine’s voters, it is worth noting its success,” the report stated. Charlie Summers, who signed that report shortly after he was selected as secretary of state, has said he no longer supports its findings. Last month, Summers released the findings of an investigation into voter fraud and concluded that, although only one case of fraud was found, the system is vulnerable and needs fixing. Dutson lauded Summers for his commitment to improve the system. “Election Day registration is something we should aspire to, but [Maine] has no structure in place to make it work,” Dutson said. Maine is not the only state that has seen changes to voting laws in the last year. Many states, including several presidential battleground states, have passed legislation that places additional requirements or restrictions on voters. In nearly all cases, the state legislatures or governor’s offices or both are controlled by Republicans and some critics fear the movement is designed to affect the November 2012 presidential election. The outcome of November’s referendum in Maine could determine the future of a bill awaiting action in the Legislature that would further restrict voters by requiring them to show valid identification on Election Day. LD 199, modeled after similar laws passed in other states, was carried over from the first session.